Update January 16, 2018: As of today, the YouTube Partner Program now requires that your channel have at least 1,000 subscribers and 4,000 hours of watch time over the past year. 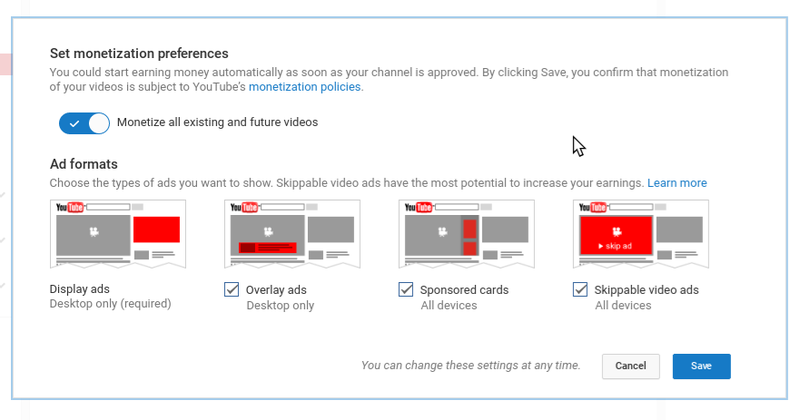 Currently monetized channels that do not meet those requirements will continue to show ads through February 20th. Learn how to use YouTube Analytics to understand your channel's watch time. 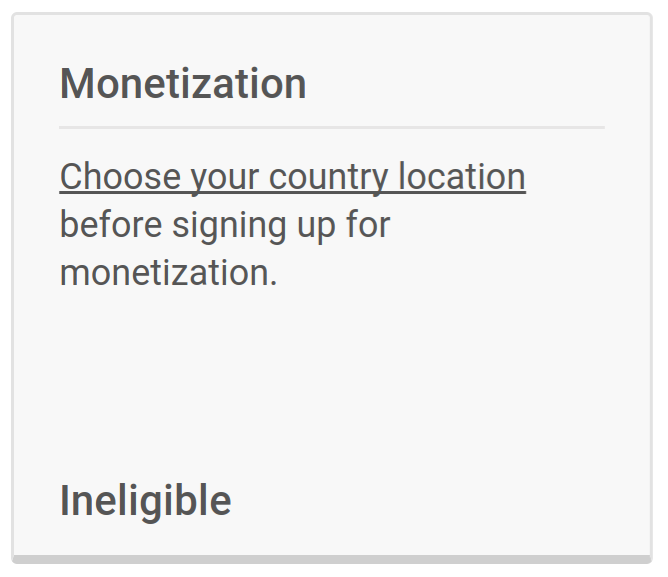 YouTube recently changed the eligibility requirements for monetization. Your channel must have at least 10,000 public lifetime views to display ads on videos. And if you are not currently a Partner, you now need to apply for the YouTube Partner program. 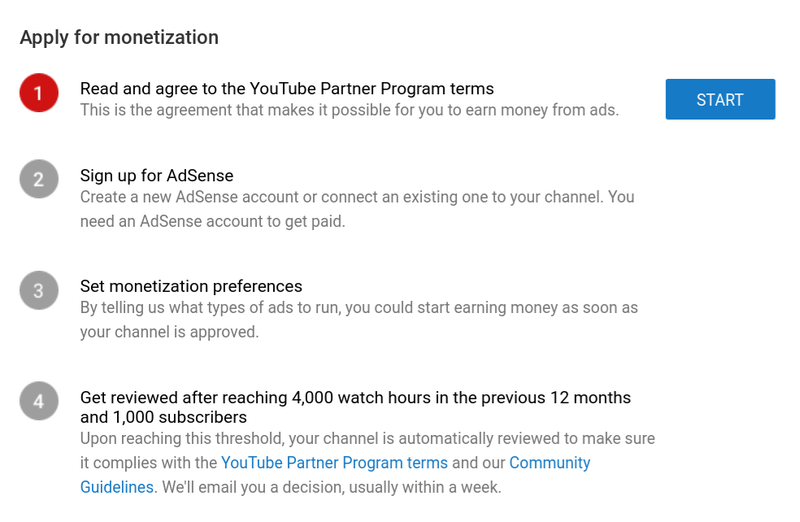 While that means you won't be able to immediately start monetizing videos on your new channel, you can set your channel up so it's ready to start monetizing when it becomes eligible. 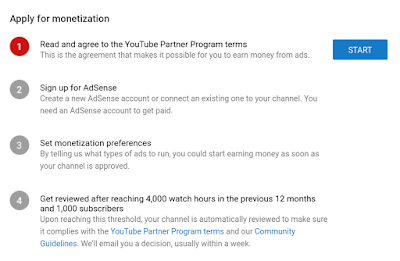 Is your channel eligible for monetization? 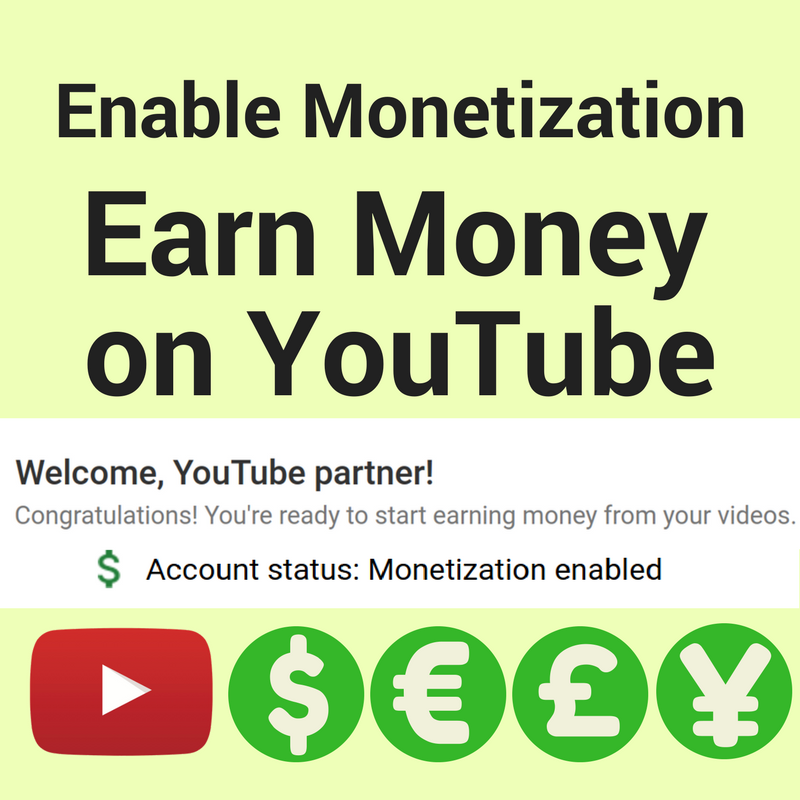 Check your channel Status and Features (https://www.youtube.com/features) to see if your channel is eligible for monetization. If your channel is not eligible , you should see a reason why. 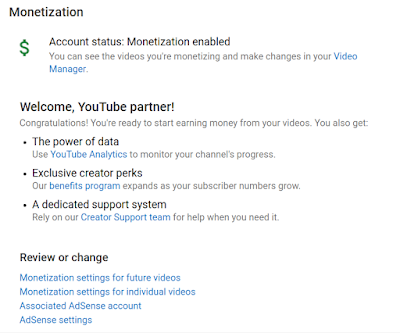 To start the monetization setup process, click Enable on your channel Status and Features page, or open the Monetization Settings directly (www.youtube.com/account_monetization). First - before you do anything else - read all the policies and ensure that your content is eligible for monetization! What kind of content can I monetize? The next step is to associate AdSense with your YouTube channel. You must have an active AdSense account to monetize your content. If you have had an AdSense account disabled for invalid activity (or any other reason), you are not eligible to monetize your videos. Read and understand the policies before you start monetizing your content. Before you start: make sure your browser accepts 3rd party cookies, and temporarily disable any ad blocking extensions. 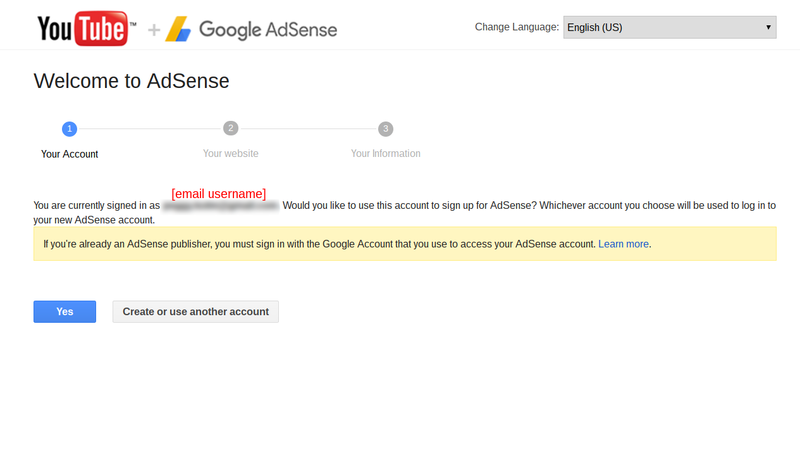 NOTE: If you have an existing AdSense account, you are NOT allowed to create a new AdSense account. 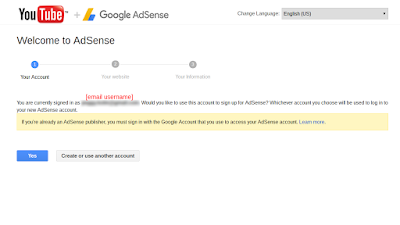 Link your existing AdSense account instead. Follow the steps on your screen to complete the AdSense application or linking process. AdSense applications are usually reviewed within a week, but sometimes may take longer than that. Learn more about setting up AdSense in the YouTube Help Center. 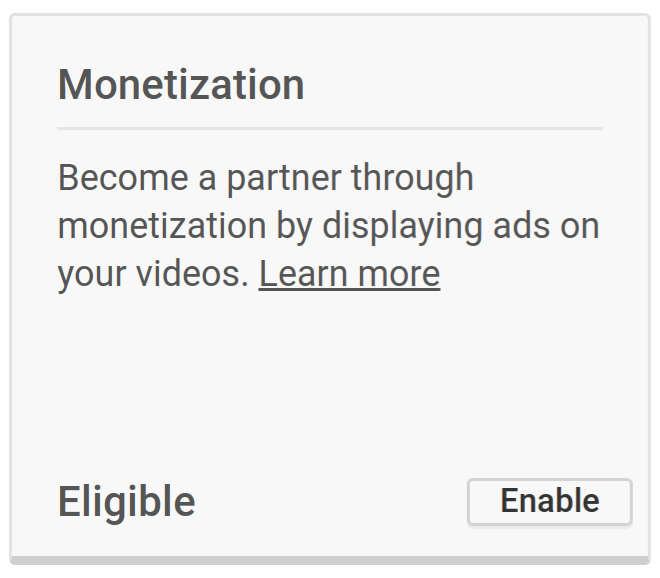 You can select monetization options for your video uploads, so they can start earning money as soon as your channel is approved for the YouTube Partner Program. Next to Set monetization preferences click START. You can set what types of ads you want to run on your videos by default. You also have the option to monetize all existing and future videos. 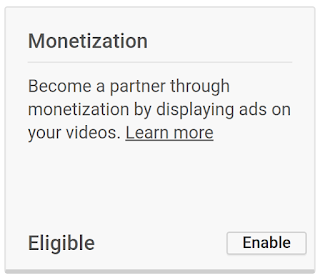 My suggestion: before you select the option to monetize all your videos, you need to be 100% positive that all of your current and future videos are eligible for monetization. 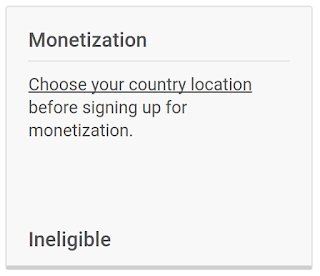 If you submit videos for monetization that are not eligible, your monetization can be permanently disabled. A safer option is to manually select the videos you want to monetize. You can change the settings in your YouTube account's upload defaults so that your new videos are either automatically monetized or not monetized. Note: YouTube implemented stricter eligibility requirements on January 16, 2018. Previously your channel had to have 10,000 lifetime views. Once your channel has at least 1,000 subscribers and 4,000 hours of watchtime over the past 12 months, your application for the YouTube Partner Program will be reviewed. 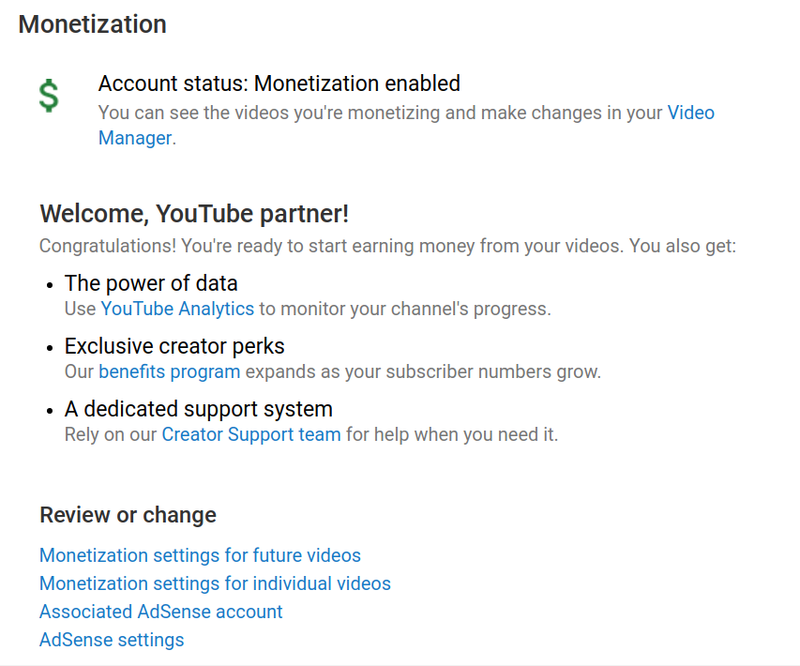 Your monetization settings page shows the progress your channel has made towards that goal. YouTube looks at whether your channel activity adheres to the YouTube Partner Program policies, YouTube Terms of Service, and the YouTube Community Guidelines. The review process may take up to several weeks, so be patient! When the review is complete, YouTube will send you an email and you can always check the status on your account's monetization settings tab (www.youtube.com/account_monetization). If your application is rejected you can get your channel into compliance with YouTube policy, and re-submit an application after 30 days. If your application is approved you can start earning money from your videos! 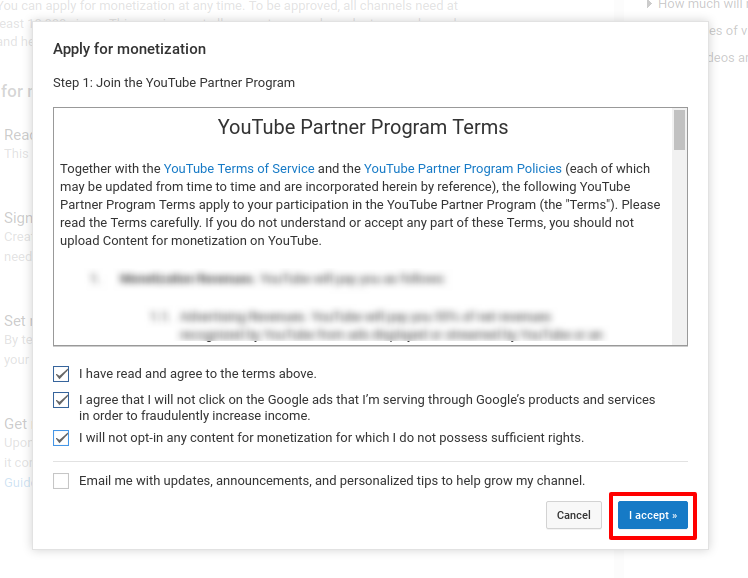 You can always change the settings and review the terms you agreed to on your channel's monetization settings tab (www.youtube.com/account_monetization). See your estimated earnings in your channel's YouTube Analytics Revenue report (AdSense does not show estimated earnings from YouTube). Get details about your channel's estimated monetized playbacks, CPM, ad impressions by type and more in the YouTube Analytics Ad Rates report. Set up your payment details in your AdSense account so you can get paid. If you want to show AdSense ads on your own website or blog, you will need to upgrade your Hosted AdSense account for AdSense for Content. If you have questions, contact YouTube Creator Support or post a question in the official YouTube Help Forum. What will happen if your get strike while waiting for monetization, does it effect monetization issue? If your channel has a strike or copyright issues when it is reviewed for the YouTube Partner Program, that might result in an unsuccessful application. Hello Dear Peggy~k My Name Is Manir Uddin Ahmed And I Really Need Your Help Regarding My Youtube Channel. My Youtube Channel Is Related With Comedy And I Make Really Good Videos And My Subscribers, Like My Videos. And I Completed All The YouTube Policy And Also I Some Of My Video Gets Millions Of Views I Apply For Monetization Almost 3 months Ago But I Didn't Get any Kind Of Reply from Youtube. I Works Really Hard On Youtube And I invested My All Money on It But The Youtube Team Is Not Responding. So I See You On Google Fourms And You Are The Best And Top Contributor Of Google Forms And I Know You Can Help Me Regarding My Monetization. My All Videos are Really Good And Funny And They Are Fit On youtube Policys. And Kindly Reply Me For Further Detail. Hi Manir Uddin Ahmed: if your application for the YouTube Partner Program is still under review, all you can do is continue to upload original content and make sure your channel complies with the YouTube Partner Program Policies. YouTube will eventually get your channel reviewed. Hopefully soon. But I can't do anything to speed up that process.